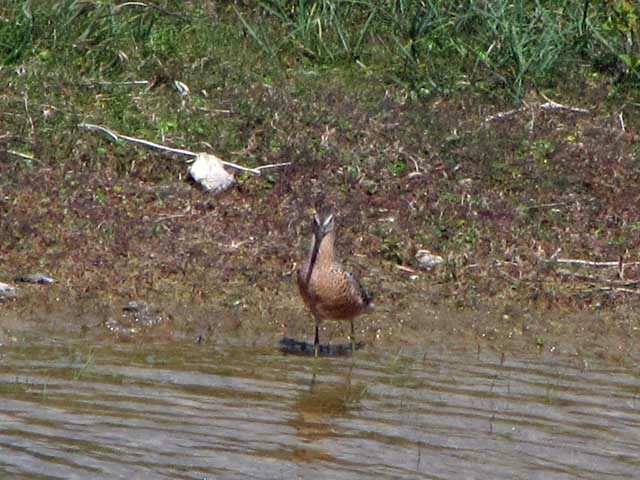 Highlights: Three Glossy Ibises briefly visited Campfield Marsh (28th) while the Leighton Moss bird made occasional forays into the county, appearing near Arnside (18th & 25th-26th). The Great White Egret remained at Campfield Marsh (to 11th). 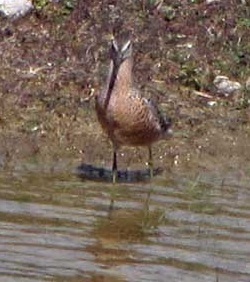 A Hoopoe was reportedly photographed near Stainton (15th). Highlights: A Glossy Ibis was photographed in flight near Flookburgh (3rd). 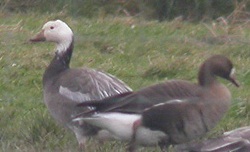 A blue morph Lesser Snow Goose accompanied Pink-footed Geese on Newton Marsh (19th). The Great White Egrets remained at Campfield Marsh (all month) and Kents Bank (to 11th). 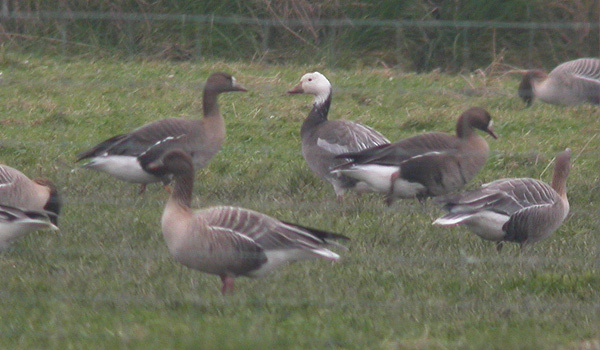 Highlights: A first-winter Red-breasted Goose, the fourth county record, was a surprise find among the Barnacle Geese at Drumburgh then Cardurnock (22nd) while a blue morph Lesser Snow Goose accompanied Pink-footed Geese at Abbeytown (3rd-6th). The drake Green-winged Teal lingered at Hodbarrow (to 28th) while others appeared at Campfield Marsh (4th) and Siddick Pond (14th). The Great White Egret reappeared at Campfield Marsh (from 14th) while the long-stayer was seen intermittently at Kents Bank (to 14th). Highlights: The Leighton Moss Glossy Ibis briefly crossed the border from Lancashire, being seen in flight near Arnside (15th). A drake Green-winged Teal lingered at Hodbarrow all month, briefly joined by a second bird (3rd), the first multiple sighting in the county. The Great White Egret remained around Campfield Marsh though ranging more widely and being joined by a second bird at Burgh Marsh (24th) while the long-stayer was seen intermittently at Kents Bank all month. Highlights: Drake Green-winged Teals were found at Siddick Pond (20th) and Haverigg (20th-21st), both presumably returning birds. New Great White Egrets appeared at Campfield Marsh (1st-30th) and Bassenthwaite Lake (16th-25th) while the long-staying individual remained at Kents Bank (to 10th). A Yellow-browed Warbler was found at South Walney (4th). Highlights: An immature White-tailed Eagle, presumably from a reintroduction scheme, visited the Tindale area (13th). 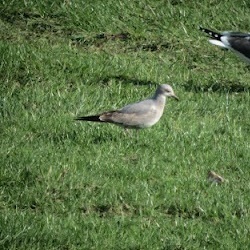 The juvenile Buff-breasted Sandpiper lingered on Arnside Marsh (to 1st) as did the two juvenile Pectoral Sandpipers (to 2nd), with one remaining (to 3rd) while new arrivals came in the form of a brief Long-billed Dowitcher at Port Carlisle (16th) and another juvenile Pectoral Sandpiper that lingered in the Lyth Valley (21st-27th). A Yellow-browed Warbler was found at Rottinton near St Bees (30th) while the long-staying Great White Egret remained at Kents Bank (to 16th). Highlights: A juvenile Buff-breasted Sandpiper, the first in the county since 1998, frequented Arnside Marsh (24th-30th) where it was joined by two juvenile Pectoral Sandpipers (28th-30th). The Great White Egret remained at Kents Bank all month. Highlights: A Spotted Crake, the first in the county since 2002, briefly emerged from cover in the central marsh at South Walney (1st).